ImagineFX 150th anniversary issue: Look inside! Take a peek inside ImagineFX’s 150th anniversary special – on sale now. 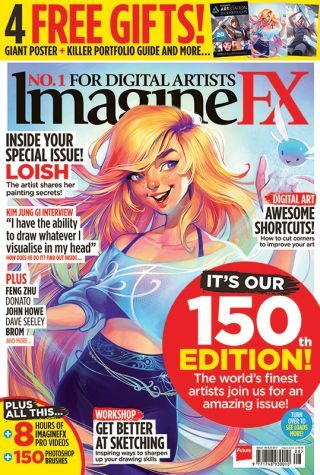 ImagineFX is celebrating its 150th issue anniversary! To celebrate, readers are being treated to a special issue, complete with two free gifts: an A2 poster featuring the art of Jana Schirmer and Lois van Baarle, and a 20-page supplement in association with ArtStation, exploring how to craft a killer portfolio. Buy the ImagineFX 150th anniversary special now! The team has also pulled out all the stops to bring you the best artists in the world. Loish – who has worked with the likes of LEGO and Marvel to bring their characters to life – has created the show-stopping cover art, and inside shares her expertise to show you how to paint your own bright, dynamic figure. Readers can also take a peek inside the sketchbooks of Hollywood film veteran Feng Zhu and Hugo award-winning illustrator Stephan Martinière; find out how Kim Jung Gi went from college dropout to sketching giant in an exclusive interview; and glean book illustration tips from Lord of the Rings artist John Howe. This issue's tutorial section comes packed with advice from industry-leading experts to help you sharpen your skills (use the arrows to scroll through the gallery below). First up, shortcuts aren’t cheating – they just free up precious minutes so you can focus on making your designs even more awesome. Studio Soi’s Domareen Fox runs through 14 top tips to help streamline your workflow and save you time. Even the most basic of sketches can turn into magical paintings. This month, Daniel Landerman reveals his advice for improving your sketches – whether that's by remembering to warm up or exploring calligraphy tools. In the Traditional Artist Workshop section you’ll learn how to capture emotion in your sci-fi illustrations. Donato Giancola gives an insight into how he created an emotionally arresting image for his Empathetic Robots series. 8 hours of ImagineFX video and over 150 brushes! Buy ImagineFX 150th anniversary special now!